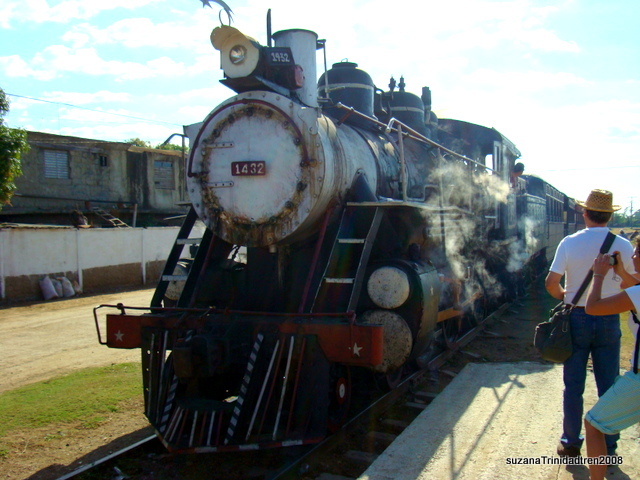 A Cuban steam train adventure! 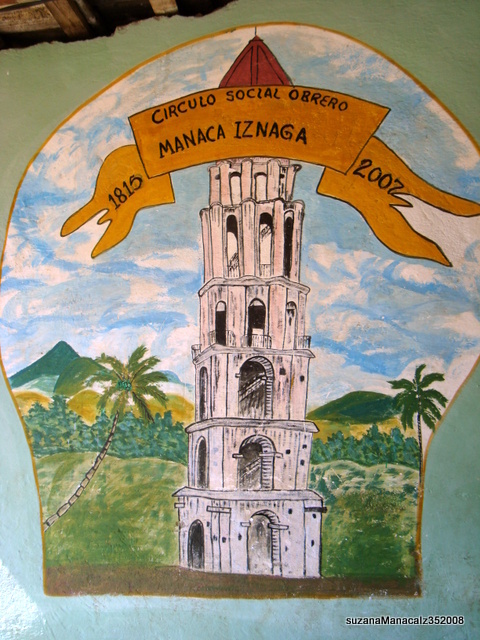 One of the most delightful excursions on our tour to Trinidad is the day we take the train to Manaca Iznaga and old sugar plantation! We all gather at the tiny rural station of Trinidad which looks as though it has been out of use for half a decade. We are awaiting the arrival of this amazing old steam train which announces itself loud and clear as it approaches! Steam billowing out of the smokestack and smoke from the furnace. Everyone is eager with anticipation not believing that this puffing monster is going to take us to our destination and back again! We get onto the old fashioned carriages and take or seats for the trip. 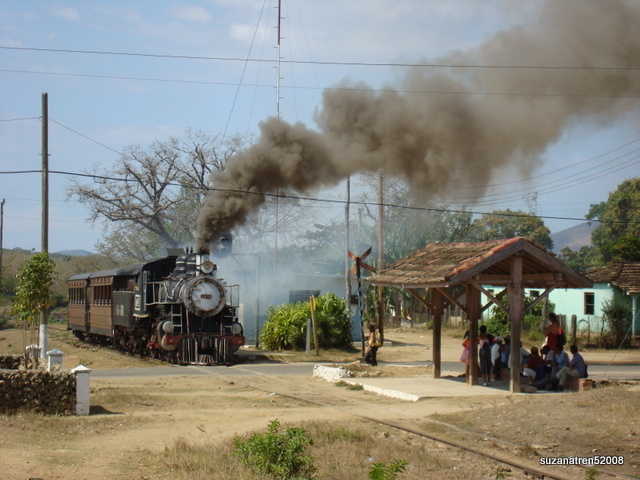 After a short delay we chug out of Trinidad under steam, and with several blasts of the whistle, children, bicycles, grazing horses and dogs flee from the train’s path. The speed is leisurely and we have a superb view of the rural landscape, passing through rough grazing land and small holdings. A good pair of binoculars at the ready and bird watches will not be disappointed! The train comes to a stop in the middle of a small bridge and a wide hose is fed into the stream below to fill us up with water. This takes a little time as the hose looks as old as the train and several holes make it somewhat leaky!!! Time to chat and look out the windows. 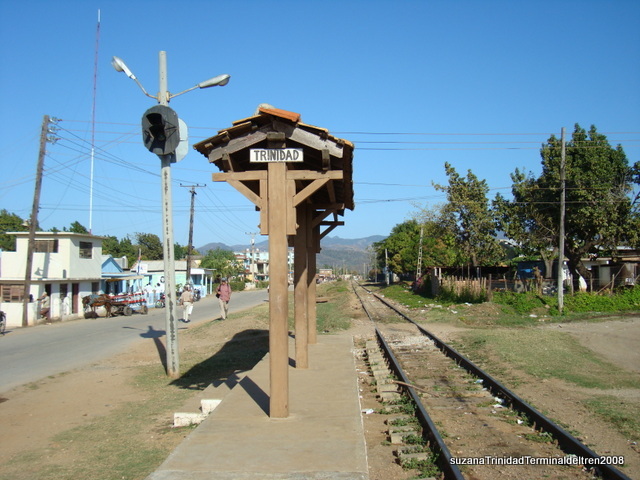 We are off again and continue uninterrupted until we arrive at Manaca Iznaga station. The colonial house is now a visitor’s centre and the tower is a vivid landmark and reminder of the unhappy people enslaved to work this land, once producing the best sugar in the world. 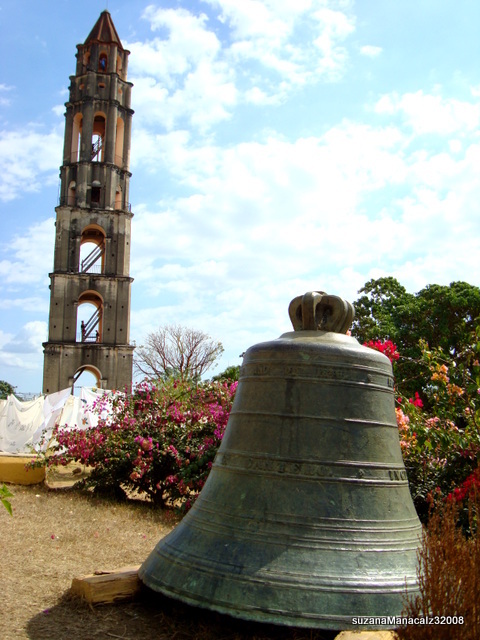 The bell that rang out the hours of work is no longer in the tower but stands on the ground at the entrance to the house. 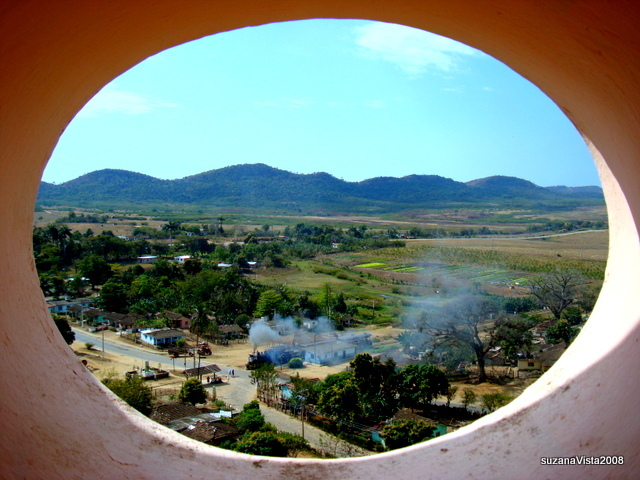 For a peso or two you can climb the tower on its rickety step ladder and the views from the top are awe inspiring. Down below there are local ladies selling their beautiful pulled thread and embroidered white table clothes and napkins traditional to this region, plus many other knick knacks from further afield. 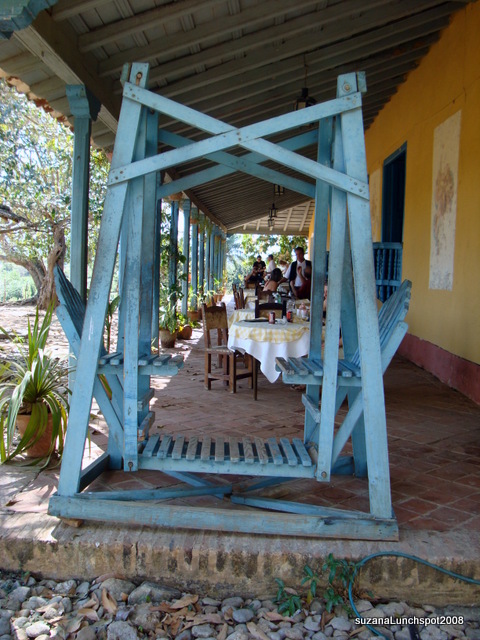 If you are in need of refreshment or toilets these are available in the house, where you may also find an opportunity to sample freshly squeeze sugar cane juice, in the back courtyard. Once more we return to the train and continue to another colonial house where lunch or other light snacks can be purchased. A typical musical group plays recognisable tunes by well loved Cuban composers and horses are available for a short ride if you are not hungry. Chickens wander around ever hopeful for crumbs and everyone relaxes in the shaded verandas out of the blazing sun. What a fabulous way to spend the day and see the countryside. Our return journey is direct to Trinidad with the no scheduled stops …. Trains and railways have been a crucial part of Cuba’s history and key to the success of the revolution in 1959. If you are a train enthusiast then the train museum in Havana will be on your list of visits and you might fit in the Hershey train from Casa Blanca to Matanzas if you have a free day! 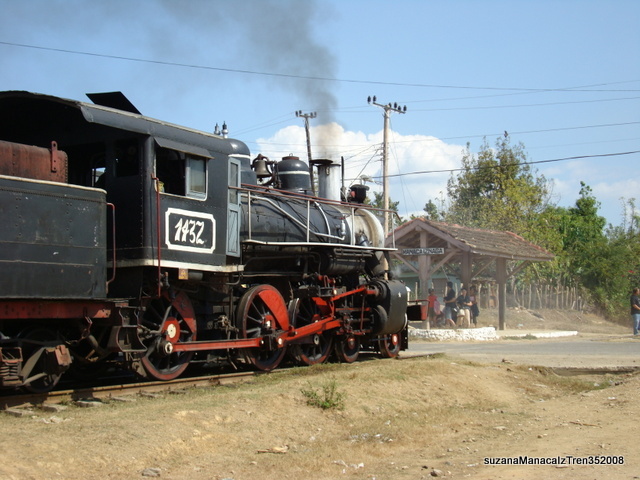 It’s a sad reality that the train system in Cuba has been more or less abandoned due to lack of government interest, but thanks to tourism some of these old machines have been revived and continue to earn their keep! 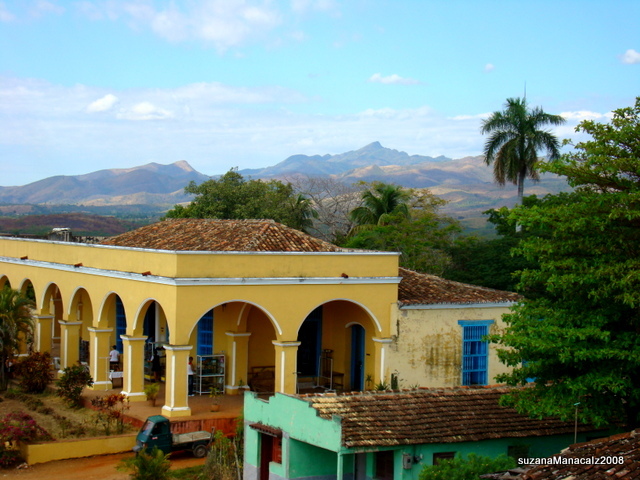 Why not book a tour with encompass tours and se Cuba for yourself? your tours look very intresting a must do!